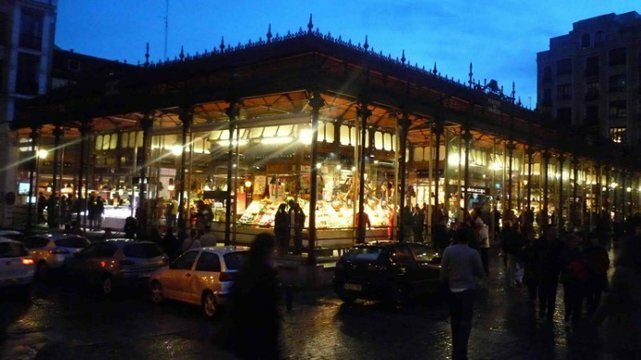 The origins of San Miguel's marketplace date back to the XII century. In its current location was the San Miguel de los Octoes church, which Joseph Bonaparte, nicknamed the king of plots, suppressed in 1809. During his reign, Napoleo's brother persisted to create open spaces in downtown Madrid and the winding neighbourhood where this church was located was transformed. In the old building's esplanade, the storekeepers started improvising displays on wooden crates that were used as shop fronts for their perishable goods, like fish. In the mid-XIX century, there were up to 90 displays in this site, but it's only in 1916 that the market was inaugurated as such. That's when a roof was built with an impressive metallic structure that we can still admire. Over the years, the activity in the market declined and its demolition was considered due to its low profitability. However, private individuals decided to bet on its potential and after 19 months of work, in May 2009, the market opened its doors again. It kept ancient architectural alements like its molten iron structure which makes it one of the rare examples of iron in architecture. Another key element of this place is the stained glass offering the passer-by a beautiful show of colors. It is currently much more than a simple market because it offers the possibility to enjoy its specialty food stores and to have a little gourmet trip. Fine products and good wines are awaiting you. Enjoy the tasting! M-T-W-S: from 10:00 am to 12:00 pm. - T-F-S: from 10:00 am to 2:00 pm.